I was going to start with how this song is about being caught in the daily grind. If you attended any graduations between 1995 and 2002, you know this song. It’s an ‘old millennial’ anthem about how life grinds you to dust ’til you need ‘Jesus’. Figuratively speaking, That’s a decent place to start a conversation about the planet that rules the number eight, Saturn; the grumpy teacher that will grind you into dust, if needed. But then I stumbled on the backstory of this song.. It was one of those songs that you liked even if you didn’t like alternative rock, and for a little while, you heard it everywhere. Meanwhile, the one who wrote it, Richard Ashcroft, made just a grand from the song and lost all his rights in the deal that got the song released. Ultimately the band made almost nothing from it and then later got sued over that part with the violins, in the beginning, you know the part. Apparently, that riff was from a Rolling Stones song..
And the part owner of the original song, Allen Klein, wouldn’t license its use unless he had 100% of the publishing rights. He’s the reason we heard this song in Nike commercials, in movies, at games, everywhere. What kind of deal even is that?!!!…. While reading about this, I wondered if he’s a Capricorn. So I pulled up his chart. Well, actually, I pulled up several versions of it with different birth times since I didn’t have the exact time of birth. In each case, he’s not a Capricorn. He does however have five planets within ten degrees of each other in the sign of Capricorn. In fact, he’s only just barely a Sagittarius with his Sun on the very edge of the border between the two signs. Hmmm. It doesn’t surprise me that someone this shrewd would have a lot of that Capricorn/goat energy in their chart. Goat energy is Saturn energy. Saturn – ruler of Capricorn, traditionally also Aquarius, and the number eight – drives a hard bargain. The only person who likes a hard bargain is the person who makes bank off of it. It wouldn’t be a leap to say that lately we are done with hard bargains drawn up in the name of the bottom line. They stifle the creativity and dreams of younger generations and, depending on how the money is made, threaten their safety. 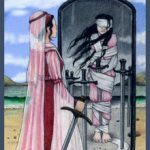 It’s not that business or earning is always necessarily ruthless, but it builds on precedents that have always been about survival. And often that survival has been wrapped up in the coercion, manipulation, and utilization of the effort of others. Saturn is all about effort, the kind we make for ourselves and the kind we harness in others when we bind them to our will. Our relationship with Saturn will depend on our relationship with effort, the effort of earning and of growing wiser. Even in a fair situation where everybody does their part without evil deals, work in and of itself is not popular. Hence, this planet has a pretty bad rap even at the best of times. 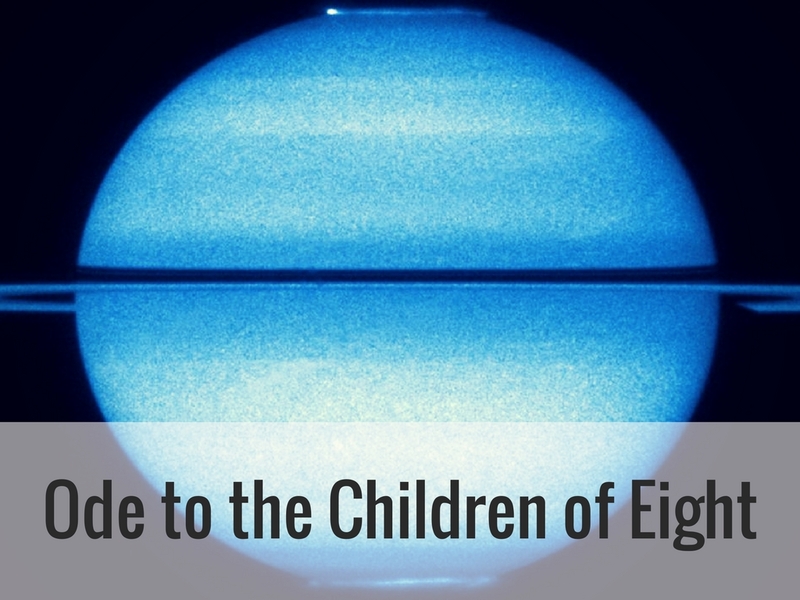 Saturn is often teaching the value of due diligence and is, unfortunately, a doting teacher. What can we learn from the hard bargain? Not too long ago I got a reading from Dayna Nuckolls of The People’s Oracle where I learned that in sidereal astrology, I’m a Capricorn, as opposed to my Western or tropical sign of Aquarius. 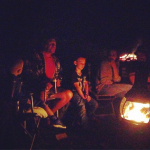 For some, it can be jarring to hear their astro-story through the sidereal lens after spending years feeling comfortable with a tropical story. I had none of that. Maybe it was my Cap moon, my problems with authority. Maybe how the Devil card, with its Saturnian messages, stalks me. I wasn’t surprised or phased in the slightest. Saturn’s been talking to me for some time now. As I geared up to write this post, Saturn was entering its home base sign of Capricorn. The last time it was in this sign, I was getting accelerated lessons in adulthood. I was only seven, but I’ve pretty much been the adult I am ever since. Saturn drives a hard bargain. The number four is associated with manifestation and tangible reality. Eight is twice four; thus eight is doubly implicated in the material world. From Saturn we learn who we are, the difference between what we say and what we do, our relationship to responsibility and authority. When we try to skirt effort or delay growth, we learn the consequences. Saturn tests our desire and names the price for change. What will it cost you to manifest something in the physical world? To create? To survive? Be who you are meant to be? Saturn dares you to find out and then watches: If you chicken out, you get poked with a stick. That’s why there’s a lot of fear about Saturn return, the time when Saturn returns to the place in the sky it was when we were born. Lately, there’s a lot of hype about things being easy. How many online courses have you seen talking about making something easy? Earning money. Learning-the-thing. We want no effort anywhere. But if you think about it, effort is just as natural to life as anything else. And those who most embrace hard work and the failure that comes with it are the ones that rise to the top. The ultimate task for those influenced by the task-master planet Saturn is to avoid tunnel vision. on the backs of ancestors. careful might cripple your go. and the patience of a good story. and most will not want to go your way. 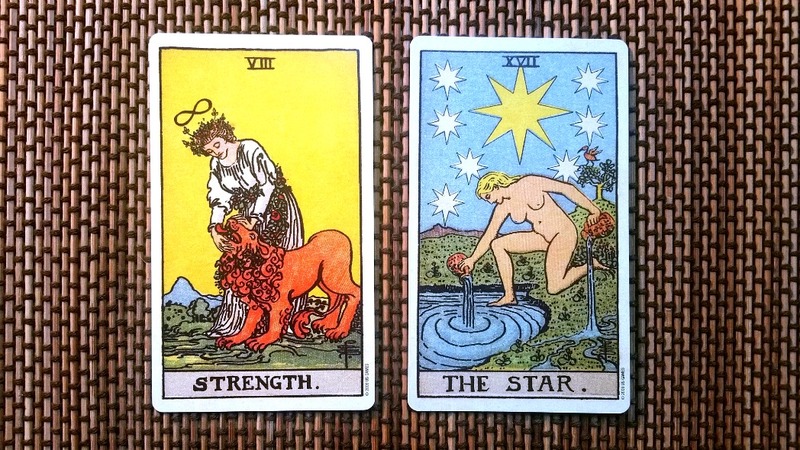 If we include the number eight in a discussion of cards associated with Saturn, you get these two cards. You almost never see these two paired with Saturnian influence, but look! Don’t they seem relevant now that we’ve been talking about it?!! On the left, the perseverance to influence the material world. On the right, the community ties or community-mindedness that often go hand-in-hand with responsibility. Guess which of these I’ll write about next? Now that the world as we know it is aging out, we as a collective are needing to usher in new ways of being. The world where the past is but a sample in a new song. A future where those who make an effort get the credit and worth isn’t stripped away according to social norms. We need a new generation of diligent beings. Compassionate bootstrapping. A reboot of tradition. Because while we haven’t seen the hardships of our elders, their way of being is leaving a new class of hardships behind as our inheritance. Our death mountain. Let’s climb. Our world depends on it. Guess where the Rolling Stones got their song, “The Last Time,” the one that they later sued The Verve for stealing? From the Staple Singers. It’s a traditional Gospel song called “This May Be the Last Time.” The version they stole was arranged by Shirley Joiner. The more you know. 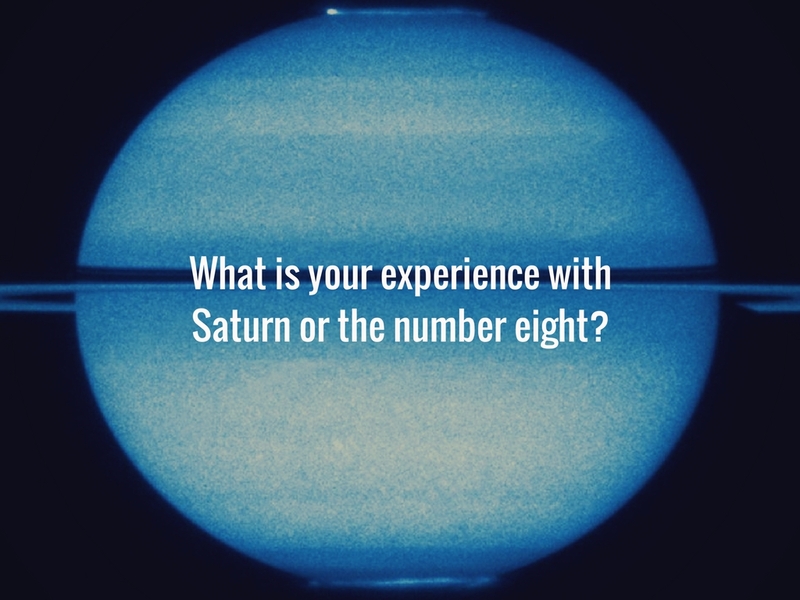 What is your experience with Saturn or the number eight? 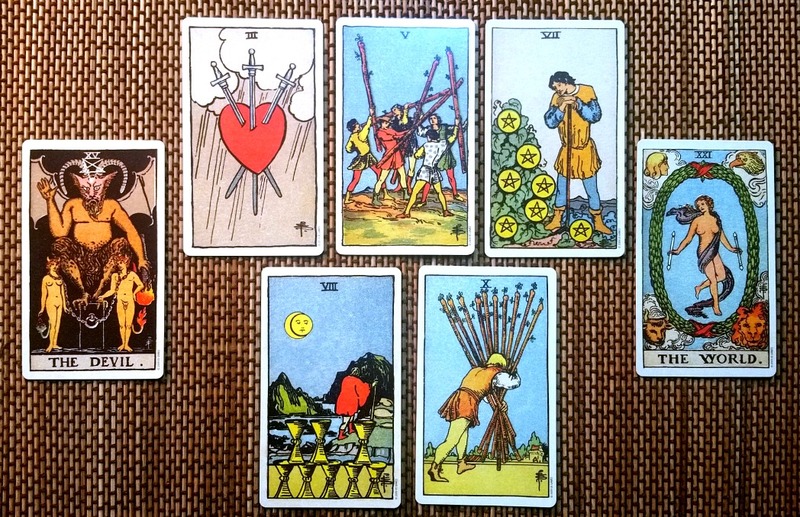 I’ve written about the Devil card a lot, even here on Little Red Tarot. I was born Aquarius rising on the 8th day of December, with Mercury, Neptune, Uranus, Saturn, and the North node of the moon all in Capricorn. To say that I feel this is an understatement. It’s almost a gift, though a strange and dark one, to be around people who wish and dream and then be the one who DOES. I am a marvel to them, when results appear, but they never seem to pay attention during the in-between. Progress feels like walking the infinity-lemniscate of the 8, round and round until a trench forms in the earth below me. But what gems are buried that deep in the ground! What a point of view it is, to see the layers of earth my simple steps have carved through. I was half in love with Saturn, by the time it left my sun sign of Sagittarius. wow! that is a LOT of Saturn-action!! I can sooooo relate! I almost went on a rant about the infinity sign in the Strength card, but managed to resist! I always thought my Capricorn feelings were about my moon sign. I only recently learned of Saturn’s traditional rulership of Aquarius, and this became EVEN more fascinating once I realised I was a sidereal Capricorn. I have a lot of feelings about the Strength lemniscate, too! I completely understand. I was only barely aware of Sidereal astrology before reading this, and now it looks like I have a lot to look into. Ends up I’m a sidereal Scorpio (which rules the 8th house, so there you go), and Capricorn AC. You’re right, it’s absolutely fascinating. I am a Capricorn born on the 8th of January. Hello Saturn! I describe my work ethic as ‘The Humble Donkey.’ I feel a sense of pride in my strength to keep slowly picking my way up the mountain of life(or death as you described). I’ve achieved a lot too. Love working hard silently and slowly, being practical and being able to share and help others. Thank you for the ode!